Start by walking Knoxville’s pedestrian-friendly downtown, known as Market Square. This square plays host to dozens of restaurants and shops, all with a distinctive Knoxville flair, perfect for browsing and souvenir shopping. Any of our recommendations in our Knoxville dining post is great for kids, too, and for Mom and Dad, several urban breweries have local craft brews on tap. 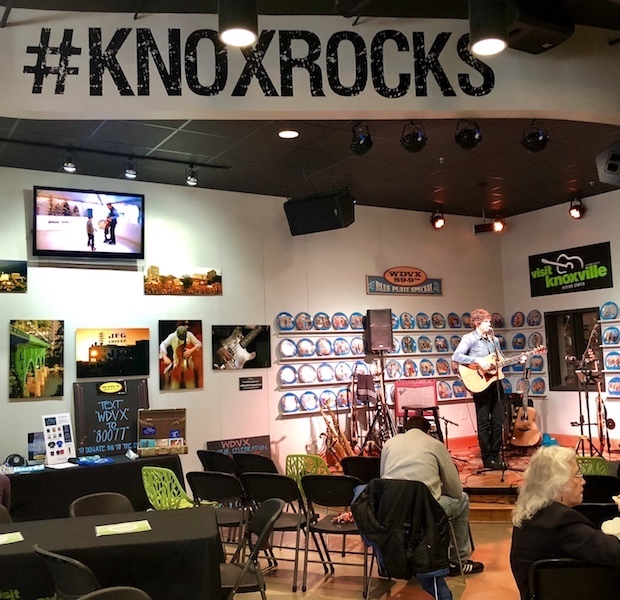 Stop at the Knoxville Visitor Center at 301 South Gay Street to take in the WDVX Blue Plate Special, a daily radio show from 12 pm to 1 pm, free to the public. New and emerging bands perform here each day, and you can bring in boxed lunches from nearby restaurants. Oh, and the red trolleys you see? Those are all free! Next, explore Zoo Knoxville, a small but progressive zoo that’s known as one of the premiere zoological institutions in the Southeast. Known for their red panda breeding program and tigers, Zoo Knoxville focuses on education more than entertainment, which we appreciate. 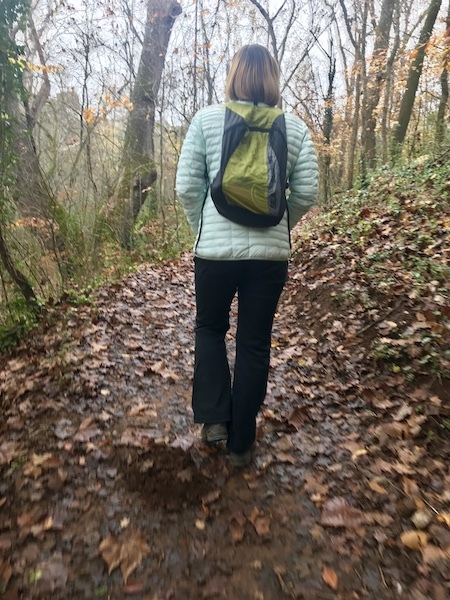 Nearby, Knoxville’s 1000 acres of urban wilderness beckons, offering hiking, mountain biking, ziplining, and playgrounds. A true gift for locals, tourists can take advantage too, exploring the park’s multiple, connected sections. All within a three mile drive of downtown, this urban park can keep families busy all day. Mountain bikers may want to start at the Baker Creek Preserve section, where a kids’ pump track and nature playground (structures all utilize natural elements like logs, stones, and slopes) sit adjacent to the park’s most technical and advanced mountain biking trail, a double black diamond created via a grant from Bell Helmets (only for the most advanced riders). Additional green and blue single track can be accessed in this area as well, all found by Taylor Road. In the northern section of the urban park sits Ijams Nature Center, certainly the hub of the park, with discovery trails perfect for young kids, an indoor center, more advanced trails that span out to a beautiful reclaimed quarry, and Navitat Canopy Adventures, hands-down the most extensive treetop ropes course and zip line operation we’ve tried. For kids age 7 and up, Navitat is a 2.5 hour experience that’s still under $50 per person, and takes guests through a half-hour on-ground tutorial followed by two hours of exploring multiple ‘trails’ in the treetops, where you navigate rope bridges, nets, slack lines, swings and zip lines, while harnessed into a cable safety system. Back in downtown, the Museum of East Tennessee History gives families a really good overview of the history of the area. Admission is low, and the museum takes about an hour to tour. 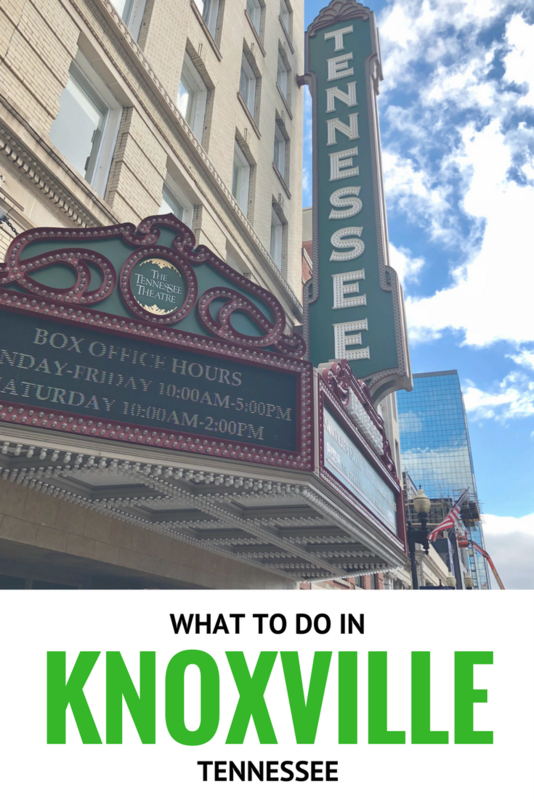 Across the street, the Tennessee Theater was once a 1920’s movie palace, now a venue for Broadway productions, musical groups, and children’s programming; it’s well worth checking the event calendar to see if a show coordinates with your visit. On the National Register of Historic Places, the theatre is truly jaw-droppingly gorgeous inside. Recently opened as a luxury category hotel in Knoxville, The Tennessean truly delivers on elegance, service and beauty. It’s located within walking distance of Market Square, is upscale without being pretentious, (definitely bring the kids), and offers one of the only elevated lodging options in the area. While I’ve stayed in more luxurious hotels, the level of service and attention to detail at The Tennessean rivaled that of a Ritz or Fairmont. After speaking with the owner of the hotel, I understand why: he values a service level in his team on par with such hotels as Blackberry Farms (in Tennessee) and my aforementioned examples. What did this service look like? From check in to check out, I was greeted (usually by name) every time I walked into the lobby, the valet staff was cheerful and quick to action, and the housekeeping staff offered turn down service nightly and even remembered what side of the bed I slept on. The Tennessean offers value in small and large ways: nightly valet parking is not terribly expensive, illy coffee machines are in every room, which also has robes, luxury bathroom amenities and fridges, there’s a continental in-room breakfast offering (starting as low as $3) as well as a full breakfast buffet ($18 at the time of my visit), a very nice fitness room, and, perhaps the star of the show, the second floor Drawing Room provides an upscale lounge experience with great city views, a fantastic bar, and small plates. Every evening, this was the place to gather for a cocktail (they’re known for their Smoked Old Fashioned) and some down time. There are multiple room configurations for families, from suites to a very rarely seen double king room with bathtub (most other rooms have very nice, large showers but not tubs) and each room, as well as the public spaces of the hotel, have touches of a river theme: The Tennessean is named after the river, not the state. Once alerted to this fact, you’ll see river touches everywhere, from the river nautical maps over the beds to the water-like carpeting. 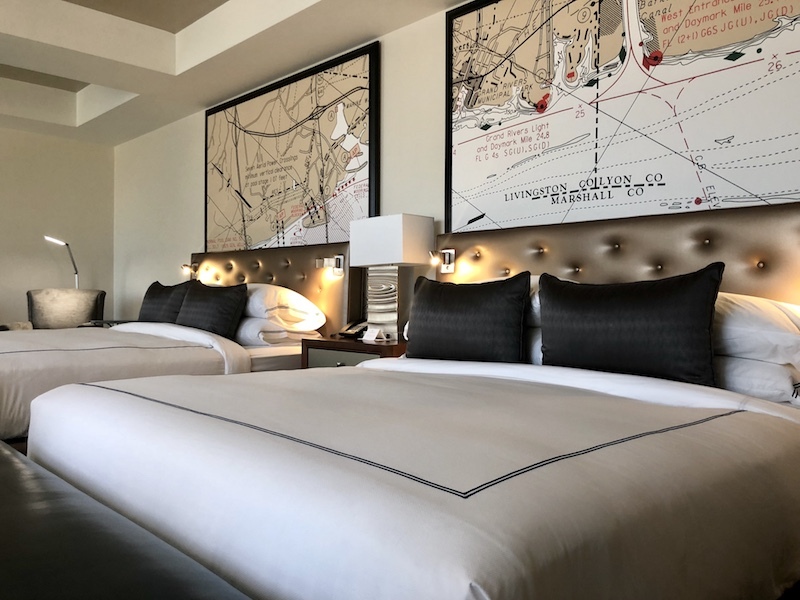 Each floor is even named after a tributary of the Tennessee River, and all furniture and artwork in the hotel are locally sourced. For families, I learned of several convenient saving hacks: the Holiday Inn right next door has a small marketplace adjacent to the lobby, which has cheaper breakfast items and drinks, and Tennessean guests have use of their pool, as well. The Tennessean is not only within walking distance of downtown, but it’s right next door the convention center and just behind the University of Tennessee. Rates vary, but families can expect to pay around $100 more to stay at the Tennessean versus the budget hotel chains adjacent. We feel it’s well worth the upgrade to elevate your stay in Knoxville. Disclosure: I experienced Knoxville and the Tennessean as a guest of the city. All opinions remain my own.